When it comes to inexpensive graphics cards, your options aren’t limited, and Nvidia’s $160 GTX 950 is quickly becoming a staple for builders on a budget. For some, the conversation ends there – you have less than $200 to spend on a card, so buy the GTX 950 and call it a day. For more open-minded gamers, the new Radeon R7 370 from AMD sets its crosshairs firmly on the forehead of the GTX 900 Series. 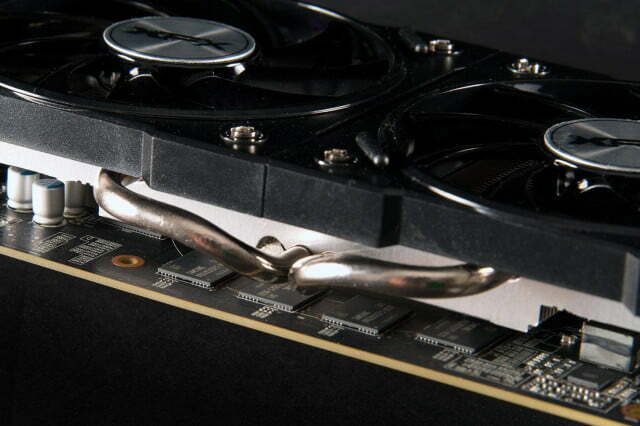 With 2GB of VRAM and a base clock of 1,040MHz, the AMD Radeon R7 370 is no slouch. 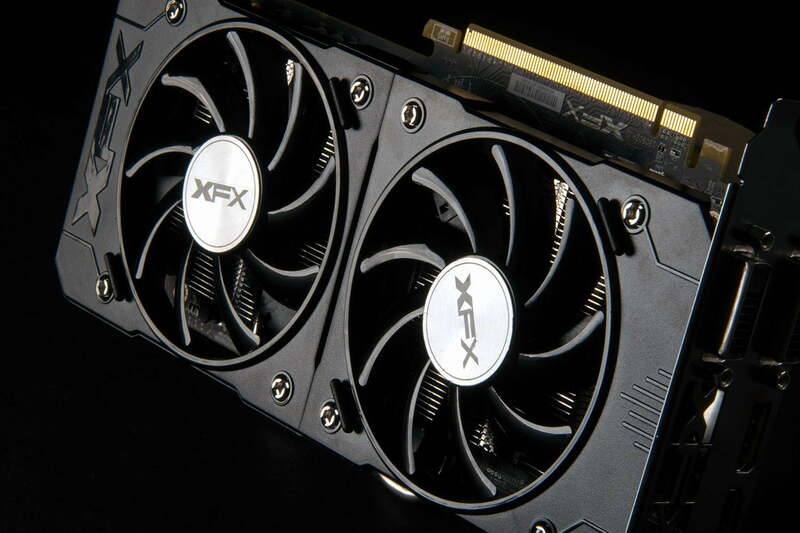 The price starts at $150, and the XFX Double Dissapation Black Edition we tested rings up at just $169, aiming the R7 370 squarely at the budget gaming crowd. 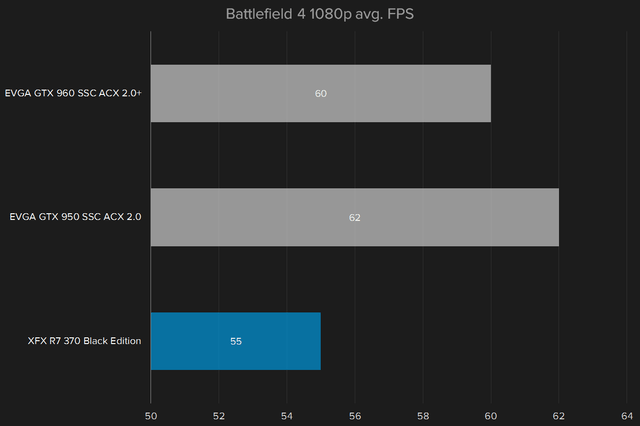 At the same time, AMD has been slipping further and further behind Nvidia as of late in terms of performance offerings. The Fury line was found to be not nearly as impressive as when it was introduced, and as much as their triumphant return to prominence would make a great story, a buyout is looking more likely every day. Can the new budget offering from AMD keep up with Nvidia’s popular mid-range series, or is it another out in the bottom of the ninth for the Radeon line? Our review unit is an XFX Radeon R7 370 Double Dissipation Black Edition with 2GB of VRAM. 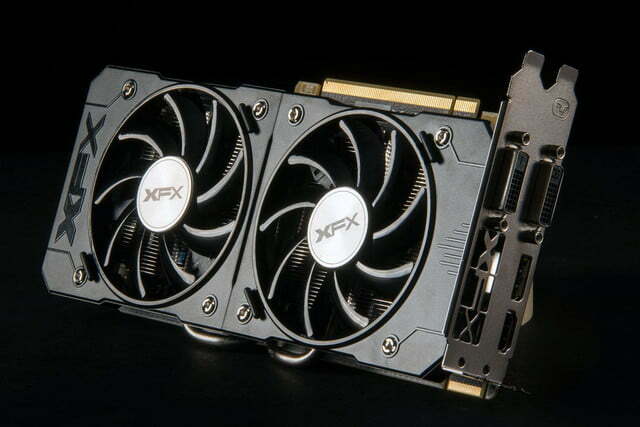 The core clock on the reference card is 975MHz, which XFX bumped to 1,040MHz. The R7 370 has 1024 stream processors, and 256 bit GDDR5 memory with a 5,6GHz clock. Despite the new name and fresh coat of paint, the Radeon R7 370 is actually a refresh of the R7 270, with the same Pitcairn GPU that originally appeared in the HD 7850 in 2012. That’s not necessarily a bad thing, since it means the price of the card isn’t too high to provide a decent value on paper. However, the older GCN 1.0 architecture does mean the R7 370 is left out of the FreeSync party, if that’s a deciding factor for you. It also means that the GPU is lacking a number of features and optimizations that AMD has released in the last three years. It supports Eyefinity for multiple monitors, but lacks AMD’s TrueAudio. The R7 370 is large, but slightly smaller than the GTX 950 or 960. The R7 370 supports DirectX 12 if you have Windows 10, but that’s not the whole story. DirectX 12 compliant cards are classified by their feature level, which tracks the different feature and optimization sets across graphics cards. AMD’s 370 is a feature level 11_1 component, while newer cards support feature level 12_0 or 12_1. 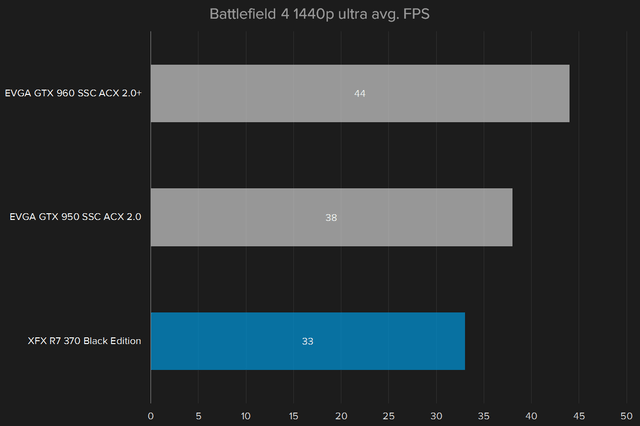 It’s not clear, as of yet, how dramatic an impact this will have on future game performance and graphics fidelity. For connectivity, the R7 370 offers a pair of dual-link DVI ports, one DVI-I and one DVI-D, plus an HDMI and a DisplayPort. That’s a fairly standard selection of outputs, and similar to what you might find on a card that isn’t intended for multiple monitors or 4K output. 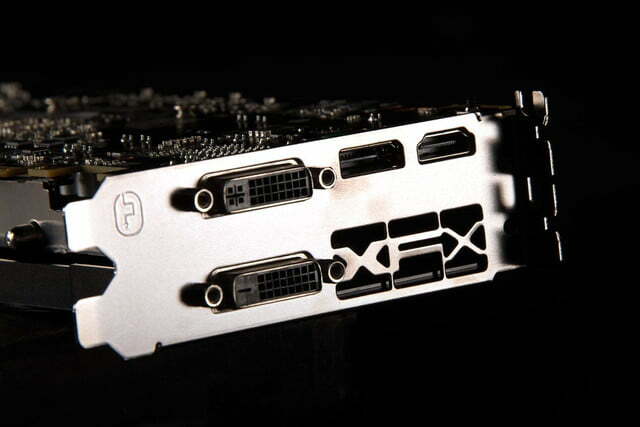 Like the GTX 960, the R7 370 requires a 6-pin PCI-E power connector inside the computer as well. In order to keep consistent comparison scores between the R7 370 and the GTX 960 and 950, we’re testing all three cards in our new Skylake test rig. With an Intel Core i7-6700K mounted into a Z170-Deluxe Motherboard that Asus was kind enough to provide for us, plus 8GB of DDR4 RAM and an Intel 750 Series SATA SSD, the machine is no slouch. 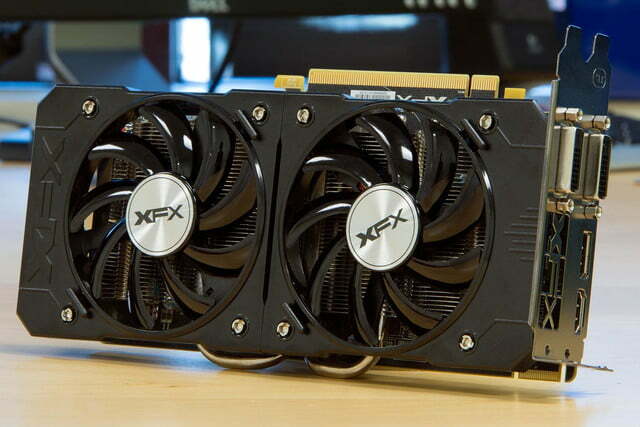 If anything is going to cause a bottleneck, it’s these wallet-friendly GPUs, which should make the difference between the two cards much more dramatic. 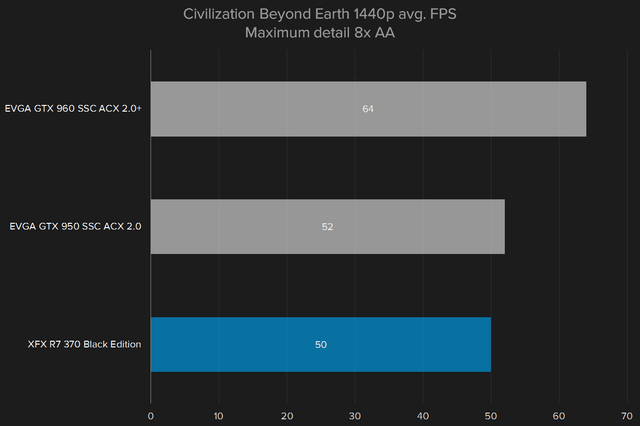 For this round of benchmarks, we ran tests at both 1080p and 1440p resolutions on a 144Hz Acer XB270HU. None of these cards are particularly well equipped for 4K gaming, and the 2,560 x 1,440 option has become a popular one lately. As far as benchmarks go, 3DMark isn’t particularly exciting, but it is a great way to demonstrate graphical and physics manipulation in a controlled environment. The GTX 950 beats out the AMD card handily here in the demanding Fire Strike test. The 370 is about 11 percent behind the 950, which is about the same ratio behind the 960. but this isn’t about tests and isolated results. 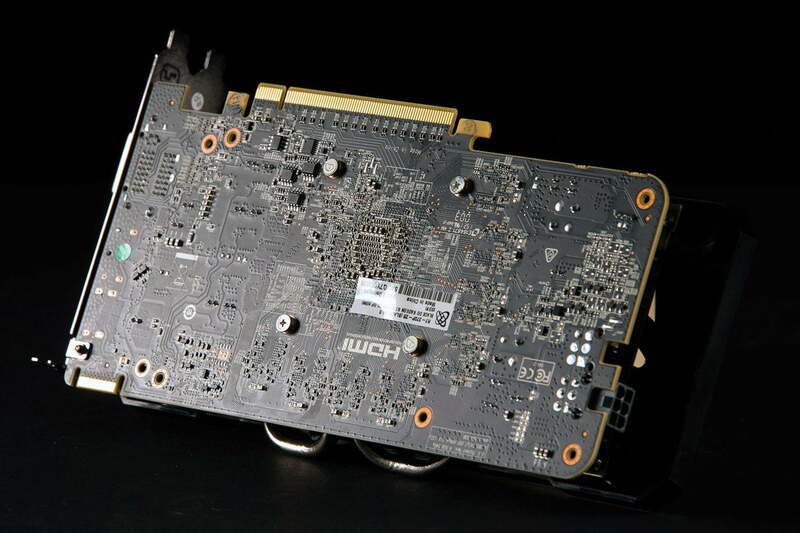 The most important aspect of a graphics card to gamers is in-game performance. Most PC gamers these days are playing on 1080p displays, both for their low price point and more easily manageable graphical demands. If you’re looking to spend $100 or more on a gaming card, chances are your monitor is at least 1,920 x 1,080. As you can see, the R7 370 comes up short of the 60 frames per second we’d like to see for modern games. 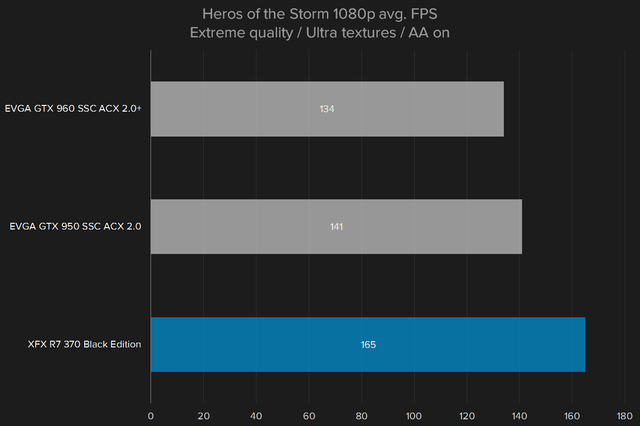 With monitor refresh rates climbing higher, 60 is becoming the minimum for performance, and except for Heroes of the Storm, the AMD card falls short of that goal. The GTX 950, on the other hand, is able to keep the average framerate over 60 even when the settings are cranked up. The R7 370 is going to be stretching for that 60 frames per second goal unless you start tweaking your settings, while the GTX 950 can handle whatever you throw at it. That gives the green team an obvious advantage. 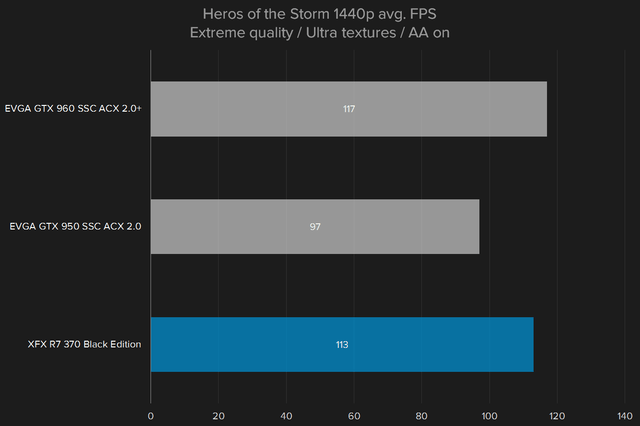 While 4K gaming is still a significant jump in terms of graphical demands, and beyond the ability of these cards, 1440p is becoming a popular middle ground for gamers looking to squeeze some extra resolution out of their existing gear. Unfortunately, none of these cards is up to the task of running games at their highest quality when set to 1440p. 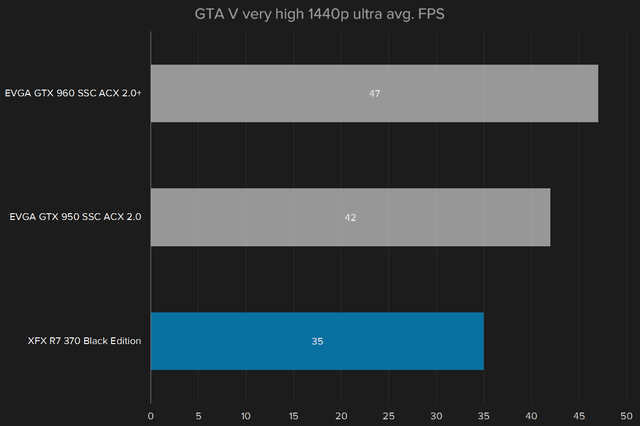 Even the GTX 960, the highest-end card of the bunch, still comes up short of 60, and often 50 frames per second average. The only exception is Heroes of the Storm, but what’s almost more important there is minimum framerate, which will determine whether you can stay alive during a team fight. The R7 370 comes out further behind there, hitting a low framerate of just 43 compared to the 61 and 71 frames per second on the 950 and 960 respectively. It’s worth noting that the R7 370 isn’t particularly quiet or power efficient, especially compared to the budget offerings from Nvidia. 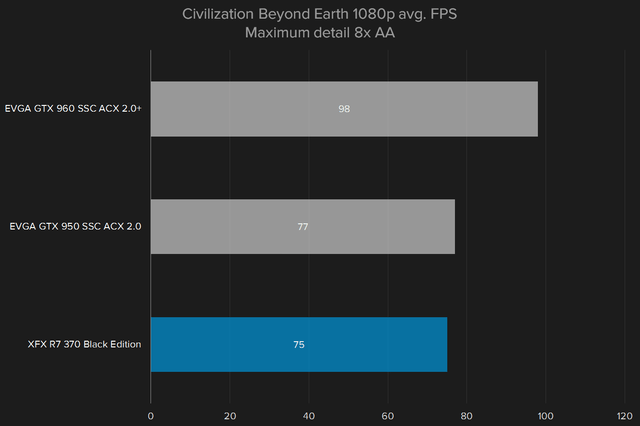 The AMD falls short of the 60 FPS goal at 1080p in some tested games. At idle, the fans on all three cards we compared shut off, reducing the noise level to, essentially, silence. The other parts of your system may cause there to be some passive noise, but it won’t be due to the GPU. None of the cards are particularly loud when kicked up at load but at just over 40dB, the AMD R7 370 was the loudest of the three. Power usage is a different story altogether. At idle, the Nvidia cards, plus our test system, only draw between 54 and 58 watts. Even without anything else running, the R7 370 idles at just over 115 watts – that’s more than the GTX 950 and 960 combined. At full load, the GTX 960 and R7 370 use up 184 and 189 watts respectively, with the 950 using a more energy-conscious 167 watts. With four cores and a base clock of 3.5GHz, this i5 is an excellent budget gaming CPU. SSDs are a cheap way to drastically improve the performance of your build, and the 850 EVO fits the bill nicely. With a 1,920 x 1,080 resolution and a one millisecond response time, the BenQ screen is a perfect budget display. It’s nothing fancy, but this keyboard and mouse combo is cheap and colorful. Despite recent efforts by AMD to compete with Nvidia at the upper end of the graphics spectrum, we found that the Fury X fell just short the similarly priced GTX 980 Ti, and now we’re seeing that pattern continues to the mid-low end of the market as well. There aren’t a lot of options if you’re set on the ~$200 graphics card range, unfortunately, and the R7 370 doesn’t quite beat out its closest competitor, the GTX 950. 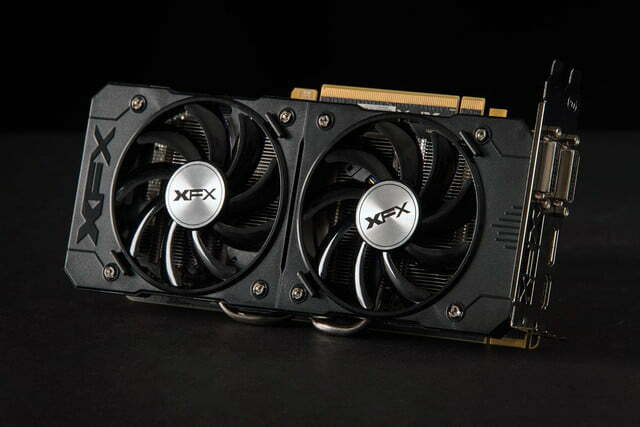 The other AMD options under $300 are the R9 380 or R9 270X. Both are a bit more expensive than the R7 370, and both offer 4GB of VRAM. The R9 380 packs in an extra 768 stream processors, as well as slightly boosted core and memory clock speeds, but only by less than 100 MHz each. The R9 270X also offers a few more Stream Processors than the R7 370, but less than the R9 380, and a slightly faster core clock than either of them. Unfortunately, the price jump on both of these cards puts them well above $200, a far cry from the value presented by the R7 370. One could make an argument for jumping to the $200 GTX 960 if 1440p is your goal, but if you’re considering spending a little more money than the GTX 960 on the Nvidia side – don’t. The next worthwhile step up from the 960 is the 970, and at over $300, it doesn’t present as good of a value, and it’s in a different performance and price bracket. 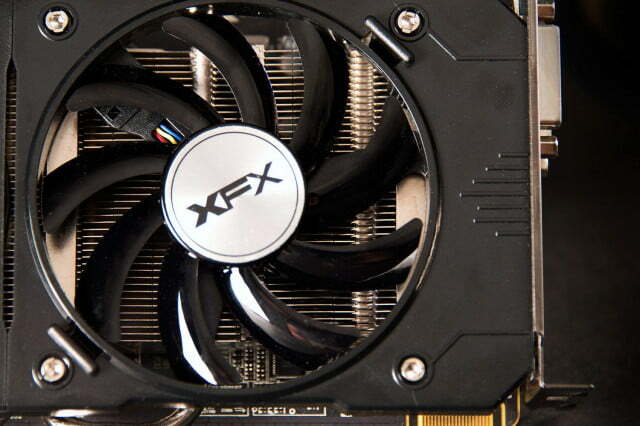 Shave some dollars off the 960, and you’ll still end up with an excellent value in the GTX 950. The price point on the AMD Radeon R7 370 is a good one, and if you drop much lower in price you’re going to be really disappointed in the performance, instead of slightly less than satisfied. It would be great to see the Radeon line continue to compete, but the GTX 950 is too solid of an offering for the aging R7 370 to beat.